Blog.com.au > A Festive Surprise: Introducing Lovehoney's 12 Days of Christmas Giveaways! A Festive Surprise: Introducing Lovehoney's 12 Days of Christmas Giveaways! Here at Lovehoney we love everything about the festive season, and this year we're decided to share our excitement by offering our lovely readers some exciting prizes. After all, what's Christmas without some jolly gift-giving? For the next 12 days, we'll be giving you all the chance to win a host of exciting prizes. 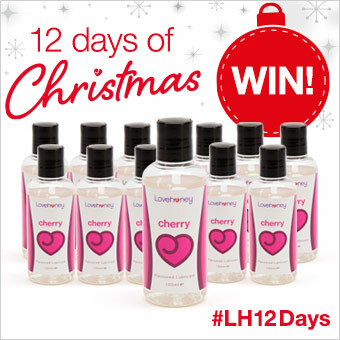 We're kicking things off by offering 1 of 12 bottles of Lovehoney Cherry Flavour Edible Massage Oil. And because we really love to spoil you, we'll have another great competition tomorrow. Each day, the number of winners decreases, but the value of each prize increases. Wait til you see what we have planned for Day 12!